Think it's going to be a quiet night in the music scene? Nope - thank Jah for the crooked i. 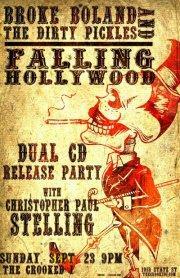 Since there's absolutely nothing else going on tonight, saunter on down to that quiet little tavern at 1013 State Street for what willl undisputedly be the biggest musical event of the e'en - it's a dual CD release party featuring local favorites Broke Boland and the Dirty Pickles as well as Falling Hollywood at the crooked i! Christopher Paul Stelling will be there too, so wear your best goin'-to-meetin' / court date clothes and take your Sunday self over to the i - your Monday self will probably hate you, but hey, that guy's a jerk anyway and he needs to stop judging.